The BBC news on Friday reported that the newly designed divorce petition, asks for the name "of the person your spouse has committed adultery with" and felt that this would lead to an increase in co-respondents being named in adultery petitions. It has always been possible to name the co-respondent but many solicitors advise their client not to do so, as it leads to unnecessary cost and delay. 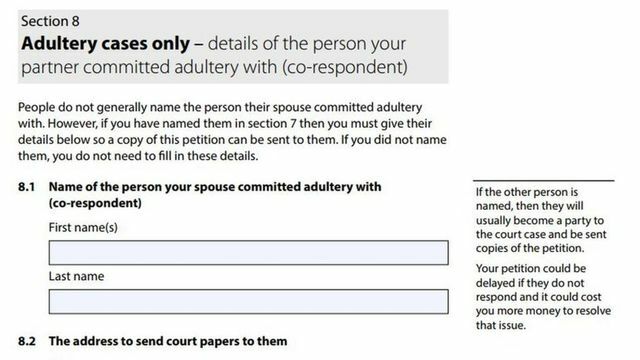 It is not compulsory to add the co-respondent's name and the newly designed form does say that "people do not generally name the person their spouse committed adultery with." If you need any advice in commencing divorce proceedings, then one of the family team will be able to assist. The online form has been updated to make the legal process more user-friendly - especially as some complete the process without seeking legal advice. The guidance on the form highlights that it is "not normally necessary" to name the person your spouse committed adultery with. But Georgina Hamblin, director at divorce lawyers, Vardags, said people are "unlikely to read the much smaller print or choose to ignore it". The older version of the form left a space for so-called "co-respondents" to be named where appropriate.